I'm following Heluva's lead and cross-posting this review I just put up on the PMTS forum. I test quite a few pairs of skis each season, but in all my testing over the past few years I've never skied on any of the revived Hart ski models. This past week I stopped into one of the small ski shops in the Denver metro and was surprised to see a quite a few Hart models on their ski wall. In talking to the owner I learned that he had demos available for each of the models so I decided to take the Pulse out for a day and see how they performed. I knew that Heluva has spoken highly of these skis so I was excited to see what they were all about. I've been looking for a replacement for my beloved Stockli Rotor 76 skis (124-76-109, 14.0m @169cm). They have a lot of days on them and aren't necessarily end of life, but I've still been considering what I should replace them with. I purchased the Head Chip 78 earlier this season (124-78-110, 14.6m @171cm) thinking that they could possibly be a suitable replacement, but they ski nothing like the Rotor 76. Hand flexing the Pulse in the shop I could tell that they were definitely stiffer than the Rotor 76 and the Chip 78. I also performed a finger tap test that gives me a fairly good indication of how damp a ski will feel on snow. I liked what I was hearing from Pulse - not too "pingy". In fact, looking at the build quality, top sheet construction, and stiffer flex pattern, if the name "hart" wasn't on the ski I would have sworn it was a Stockli. Everything about this ski seems to ooze Stockli. Speaking of the top sheet, the Pulse has the 3D (or 4D as they call it) pseudo-holographic design that many Stocklis have - kind of like a dual-layer sublimated design that has a secondary texture and pattern in addition to the main graphic. Photos don't show just how cool these skis look in person. The Pulse is built in the Italian Blossom factory alongside the well regarded Blossom and Vist skis. The length was 170cm with a 14.5m sidecut (124-77-110). Unfortunately the factory mount point on the Pulse is way far back and the Tyrolia demo bindings didn't have enough adjustment range to get me where I really wanted to be on the skis. I was only able to get about 15mm forward of the marked mount point before the heel track was spent. I really wanted to get to 25mm forward if not possibly even further (to be determined through some experimentation). So I knew going in that I was kind of limited for my demo testing. The demos were in good shape; bases smooth and even with sharp edges. However, I know from experience that almost every ski that I've ever tested, liked, and then subsequently purchased, has skied even better for me with my own tuning and preferred mounting point. Were in a period of full-on Spring skiing conditions in CO right now. So we're dealing with Spring re-freeze in the morning and softening as the day progresses. It was a bright bluebird day at LL and luckily they groomed right down the middle of Scrub under chair 4. This is one of my favorite steepish groomers at LL for testing skis and it gets total sun right from daybreak. I decided to do a "level set" first by skiing my Stockli Rotor 76s for about 5 laps before switching the Pulses. One of the traits I love about the Rotor 76 is its ability to ski nice tight turns at very low speeds. The Rotor 76 is a very "compliant" ski and is quite comfortable at slow speeds as well as at higher speeds. The Rotor 76 responds really well to working the ski from front to back and releases turns quite easily with its rounded turned up tail. On the early morning hard groomers the Rotor 76 held edge quite nicely and felt very "user friendly" as my legs were getting warmed up. Here's a quick note about the differences in construction between these skis. The Rotor 76 has what Stockli calls an Isocore which is a kind of foam and fiberglass blend - no wood. It has 2 sheets of metal and feels quite snappy - it bends readily, but isn't lifeless - it pops back with a good amount of power. Many skiers hear "metal" and think that metal in a ski makes them stiffer. This fallacy is perpetrated across many ski reviews and information provided on the web. Unfortunately this is almost universally not true. If you've ever picked up a Titanal sheet layer before it has been incorporated into a ski layup, you would find that the thickness used by most builders yields a very flexible sheet of metal that certainly does not increase the stiffness of the ski by itself. When the metal layer(s) are included in the ski layup, the overall blend of the composite construction can yield a stiffer ski, but this is mostly due to the core type (and profile) and the fiberglass layers typically used. The reason I'm pointing this out is that although both the Rotor 76 and the Head Chip 78 use 2 layers of Titanal, they are not as stiff as the Pulse which has no metal in its layup. I switched to the Pulse after about an hour of skiing on the Rotor 76. Just skating into the lift line I could already feel the power and edge grip of the Pulse, but I could also feel that I was going to have to work on finding the sweet spot for that grip because every now and then I lost the feeling of the front of the ski in a skate step. After testing a lot of skis I've actually become fairly adept at already gaining an understanding of what a ski is going to do just from skating through a lift line. As I headed down Spillway for my first run on the Pulse, I tried to ski them just as I had been skiing the Rotor 76s - big mistake. I immediately had my "hand slapped" as the skis showed me just how much more power they had in their tails. I knew from hand flexing them that they would be more of a handful on the mountain, but the power from the tails really surprised me. OK, mental note - stay on top of these skis, check. I took an easy green run, Mambo, heading over to chair 4 to feel out the balance point. What surprised me is that they really wanted to be driven center-weighted. A really strong pull back at transition that led to the majority of the pressure on the tips wasn't working real well for me on these skis. My first run down the groomed section of Scrub bore this observation out. I was dealing with a lot of edge chatter as the skis didn't like to be "forced" in the turns. I was surprised that they weren't turning anywhere near as tightly as the Rotor 76, but then again I wasn't skiing very fast and not with very high edge angles. It took me about 5 runs of trying different things before I found the magic missing ingredient - SPEED. I'm not sure why I didn't have that realization earlier since it only makes sense that a stiffer ski is going to want more "input" coming from additional speed to really bring the skis to life. It wasn't until I skied over to chair 8 that this became apparent. Coming into an easy blue groomer, Zip Trail, I had a bunch of speed off the cat walk traverse and started to really lay the skis over. I was really floored by the stability and smoothness from the Pulse. Once again, if I had been blindfolded I could have sworn I was on a Stockli. The feel was almost identical to my Laser SLs, VXLs, or Globes. I kept building up speed and the smile on my face grew bigger. I hit the lift line and thought to myself - now I get it! I took the next 4 laps on Zip Basin Street under chair 8. With the higher edge angles and speed I was able to tighten up the turn radius, but they never felt as "turny" as the Rotor 76. Anyhow, I hope the lift riders on chair 8 enjoyed the show because I was able to attain some of the highest edge angles (if not the highest) I've ever felt on a pair of skis. The Pulses were just unflappable even when moving unexpectedly between the firmer sections and into softer sections of the run. With the sun really baking the mountain I decided to head back over to chair 4 to test the Pulses out in some off-piste and mogul skiing. At this point the snow was getting quite soft on top and I found that the Pulses would perform quite well making nice quick brushed carves. Chair 4 didn't have its usual moderate sized moguls, this day they were more like "mini-moguls", but it was enough for me to realize that the Pulses, although a stiffer ski, have a really nice flex pattern for mogul skiing and I had no trouble releasing the tails between the turns. This was confirmed in larger moguls on Nix Nox, one of the better bump runs at LL. The moguls on Nix Nox had quite deep troughs, but I never felt caught up on the skis and they responded very well to strong pull backs between turns in the moguls. Overall I was really impressed with the Hart Pulse. They weren't what I was expecting, but in retrospect knowing how Heluva skis I totally get why these skis are in his quiver. They really are kind of a "wolf in sheep's clothing" - a relaxed race ski feel with gobs of stability, power, and smoothness. I liked them so much that I went back to the shop and bought a pair - even though I absolutely didn't need them in my quiver. That's a wonderful and detailed review. I have skied the Pulses a number of times as the local shop I work at from time to time has a demo pair (mounted with a stellar VIST plate and binding: the perfect binding on these skis!). You are right, they are excellent and overlooked skis. It's funny if I read your review and saw only the word HART I would have thought you were reviewing the Phoenix. Which of the two Hart carving skis is the more powerful, demanding, speed oriented machine. I've always felt that the Pulse was a fairly easy ski to ski and get very high performance out of. If you get the chance (and have the coin) I do recommend trying a VIST speedlock plate/ binding on this skis-they bring out the best in them. Liam - I think part of why my testing felt that the Pulse was more "demanding" was due to the mount position. After I ran through taking measurements and checking my calculations I will want my starting mount position to be 32mm forward of the factory mark. I skied the demos at 15mm forward. To some these numbers may sound like a lot, to others not so much, but I've found that shifts of as little as 10mm (sometimes 5mm) can result in a very different ski feel. I like to have my BoF smack on top of the center of effective edge and hopefully also the center of the sidecut (narrowest point of the waist). My calculations show that I will be able to achieve that on the Pulse and then the ski will have more "tail" which in turn will actually allow the tail to have a bit more flex. 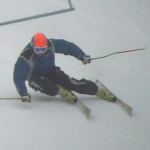 I've found that when I'm more centered on a ski I'm better able to bend it at lower speeds. So I'll post an update to this review once I've had some time on my own pair. As I said in the review, I almost always prefer a ski much more after I get the mounting point dialed in and have my preferred tuning applied. I have a whole new appreciation of High Angles ski reviews following our week in Tahoe. Very few pay attention to detail like he does and his verbal descriptions of skis amazed me, time and time again. He knows what he likes and how to describe it. Not only can he talk the talk, he can ski the ski! In my 12 skis in Tahoe thread, I mentioned that I also got on Hart Pulse skis for an afternoon on hard snow. I, too, was very impressed with the 170's as the were rock solid and changed edges very easily. A quiver update may be forthcoming, we'll see. I had the Pulse in a 178 several seasons ago when I dislocated my shoulder. I found them very comfortable to ski on an all day basis with great grip. Upon returning to skiing the season, I was conservative with respect to speed. Helluvaskier advised me to find a softer carver ski for the following season, so, following a trip to Greek Peak, my Pulse's went home with him. I believe the Pulse is made by Blossom in Italy and they are the makers of Vist skis, of which, Helluva now owns a pair. Speed helps bring them to life. A friend owns both the Pulse and and the Phoenix, as an eastern skier, prefers the Phoenix, and, can't find love for the Pulse. I wonder if binding location is an issues. Teamed with the Vist system, my experience was they are heavy. I remember Gary picking up my skis on the way the Jackson airport (my arm was in a sling) and he went "wow" due to the weight. More of a problem carrying than when skiing. Hart skis....can they survive?? My very first new skis were Hart Castle's in the early 70's. I'm pleased to announce the first quiver change for next season is in progress and the same Hart Pulse skis that I enjoyed in Tahoe are soon headed for my house. They will arrive with riser plates pre-drilled for my Marker Griffon bindings. Leaving will be my Kastle 88's - off to friend in Michigan. I just want something narrower for my small home mountain skiing. I really like many aspects of the Kastle 88's, but, I just fight with my technique on wider skis. So the quiver will include Blizzard Mag Sl's and Dynastar Sultan 94's. and the mounting position will be?? Hey Mike....congrat's....sounds like a great ski choice for you....substantial enough at 77 underfoot for a variety of conditions and sweet turning radius....excellent . Sounds to me that HA, like me is very critical about mounting point. Does your plate the plate you have coming with the ski allow you to move that forward and do you know how much? What bindings were on the ski when you tested it? My Griffons are the adjustable, so, I my thinking was I could fine tune the mount via actual skiing. But G does raise a good point about flat. The bindings on them now are Tyrolia 18's and I would be skiing them at the lowest DIN setting, but, they are mounted for my exact boot size. I can buy them with bindings, do you think that's a better choice? Another option is to use the Tyrolia Free Flex that were on my Supershapes and still in great shape. Then again, I could just get the Powerrail's. Whoever would have thought the binding decision was so complex. Hey Mike....My thoughts are if you liked them with the set up you skied them with....as well as you know, feel and understand your feet....seems to me having the same set up would be prudent. AND if the Tyrollia Free Flex are similar to design to what you tested....could be a great fit, but then ya got a naked pair of SS...what to do with those? Yes..tough decisions but getting it right....priceless! I would focus on staying with what you demoed and liked. Do they have any kind of plate on them now that would facilitate moving the SuperShape bindings without changing the nature of the ski? I'm pretty sure that, for liability reasons, Tyrolia wouldn't advertise a binding for a DIN range if it didn't work correctly over the entire range, although I always try to get in the middle of the range. You're out of your mind if you mount that ski flat. I always enjoy Helluva's simple, direct (and very insightful) analysis. So let be done, there will be no flat mount. Thanks! It's OK to be blunt -- if it's done respectfully. In this case I translated "you're out of your mind" to mean "I highly recommend that ...". Just to be clear, the skis will arrive with riser plate attached to the flat ski, so there will not be a binding mounted on the flat top of the ski. My friend has one foot about a 1/2 inch shorter than the other, so, they were mounted with a plate on one ski, the other with a traditional Tyrolia mounting for the 18 binding. A matching riser plate will be added to the ski that was flat mounted. I picked up the Tyrolia Speedplate Plus 13 and the Head Freeflex Pro 14 bindings to be mounted on my Harts. The bindings were practically dirt cheap at Ski Universe and the plates were half price through Ramp skis (I bought the last pair though). I may get them mounted up this weekend. It looks like we may actually start getting snow again in CO over the next few weeks as they're predicting a cooling trend with snow. If we get enough I may decide to actually get out on the Pulse skis before next season. LP - I agree with others in that you should go with the Tyrolia plates and bindings - a much better setup IMO.